A recent High Court judgment bears untenable consequences on the rights of irregular migrant workers. Mohammad Younis is a 59-years-old father of nine. In September 2002 he left Pakistan to work as a tandoori chef in his second cousin’s restaurant in Ireland. From September 2002 to December 2009 he worked 7 days a week without days off, except for a month in September 2009. For the first two and a half years he worked 11 hours a day and was paid 40 euros per week (0.51 euros per hour). After February-March 2005 he started working 8 hours a day. Although his pay was raised, it stayed always well below the national minimum wage of 475 euros per week. Mr Amjad Hussain, Mr Younis’ employer, paid for his initial work permit (July 2002-July 2003). However, the work permit was not renewed after the first year and Mr Younis became undocumented in July 2003. He did not speak English and his social connections were limited to his employer and his work colleagues; he therefore relied entirely on his employer for his employment permit, taxes and passport. In December 2009 Mr Younis contacted Migrant Rights Centre Ireland and left the restaurant, starting a process that would lead him to initiate legal proceedings against his former employer before Irish courts. In March 2011 the Rights Commissioner awarded Mr Younis more than 91,000 euros as backpay and compensation for breaches of Irish employment legislation. Two Labour Court’s determinations dated September 2011 upheld that decision. The case reached the High Court for judicial review in August 2012. Mr Younis’s employer claimed that he had no standing to invoke the protection afforded by Irish employment legislation, since any contract of employment was illegal in the absence of an employment permit. “The treatment of migrant workers is a vexed one which poses considerable difficulties with regard to the regulation of the labour market and the enforcement of public policy. The Oireachtas must, of course, regulate the labour market by specifically deterring illegal immigrants from taking up employment, as failure to do so could have serious medium term implications for both employment and immigration policy. If, however, that legislation is applied in a rigorous and unyielding manner it might have serious consequences for vulnerable migrants who found themselves exploited by unscrupulous employers” (Amjad Hussein v. The Labour Court and Mohammad Yunis (Notice Party)  IEHC 364 para1). Despite the cautioning against “rigorous and unyielding” interpretations, Mr J Hogan went on to consider that the Employment Permits Act 2003, which prohibits a non-national from being employed without an employment permit, rendered the contract of employment between Mr Younis and his employer substantively illegal and that, therefore, such a contract could not be enforced by Irish labour courts. In other words, the Employment Permits Act 2003 would prevent any irregular migrant worker from seeking redress under Irish labour law as their irregular migration status would make their employment contract null and void. The domestic law issues highlighted by the High Court judgment are outside the scope of this article (see, however, Darius Whelan’s notes). Rather, what follows will discuss the compatibility of the judgment with Ireland’s international obligation and its advisability as a matter of public policy. Under Article 7 of the International Covenant on Economic, Social and Cultural Rights (ICESCR), which Ireland ratified in 1989, states parties are under a duty to respect, protect and fulfil “the right of everyone to the enjoyment of just and favourable conditions of work”. These would ensure, for example: fair wages and equal remuneration for work of equal value; remuneration which provides all workers, as a minimum, with a decent living for themselves and their families; safe and healthy working conditions; rest, leisure and reasonable limitation of working hours. “The Covenant rights apply to everyone including non-nationals, such as refugees, asylum-seekers, stateless persons, migrant workers and victims of international trafficking, regardless of legal status and documentation” (General Comment No. 20, para30). “States parties are under the obligation to respect the right to work by, inter alia, prohibiting forced or compulsory labour and refraining from denying or limiting equal access to decent work for all persons, especially disadvantaged and marginalized individuals and groups, including prisoners or detainees, members of minorities and migrant workers” (General Comment No. 18, para23). Despite Ireland being legally bound by both the ICESCR and the International Convention on the Elimination of All Forms of Racial Discrimination (ICERD), ratified in 2000, their provisions are not directly enforceable before Irish courts. This is because none of the UN human rights treaties that Ireland has ratified have been incorporated into domestic law, a requirement under Article 29.6 of the Irish Constitution. More complex legal issues arise with respect to the compatibility of the Yunis judgment with the European Convention on Human Rights and the domestic European Convention on Human Rights Act 2003 (for which see Cliodhna Murphy’s article). The principle whereby courts can refuse to enforce obligations arising from an illegal deal, know in English law as “illegality doctrine” or “illegality defence”, is well established in some jurisdictions, including Ireland. It is argued here that its application to irregular migrants’ employment contracts (a) is not justified in the light of the principle’s rationale and (b) leads to untenable and/or counterproductive policies. The purposes of the “illegality doctrine” include: (i) deterring the conclusion of illegal deals; (ii) keeping individuals from profiting from their own wrong; (iii) reaffirming the rule which the illegal conduct has infringed and/or (iv) maintaining the integrity of the legal system. None of these purposes are achieved when the doctrine is applied to irregular migrants’ employment contracts. (i) Some may argue that refusing irregular migrants the protection of employment law would deter them from migrating and seeking employment in the host country in the first place. This would assume that migrants leave their country to look for better employment conditions and legal protections. In fact, they often leave their country to look for any job, as opposed to a better job, and have to accept dirty, difficult and dangerous work. A different approach in the design of migration policies focuses on reducing irregular migrants’ labour demand, by imposing effective sanctions to employers of irregular migrants, rather than trying to reduce its supply. This is the approach adopted by the European Union Directive on sanctions against employers of irregular migrants (2009/52/EC). Under the Directive, the employer who is found having employed irregular migrants must make back payments of any outstanding salary (at least at minimum wage level), taxes and social security contributions. (ii) From a moral point of view, the “illegality” doctrine aims at stopping an individual from relying on, or benefiting from, their own wrongdoing. In the case of irregular migrants, however, what is “illegal” is their entry or stay in the country, not their work per se. “The money that [irregular migrants] receive in compensation [for their work] is not a form of ill-gotten gain; they have earned it with the sweat of their brows. It is morally wrong for the state to announce that employers are free to extract that work and then withhold the promised pay” (Carens, 2008). On this basis, Joseph H. Carens has maintained that the application of the “illegality defence” to irregular migrants’ employment contracts is “fundamentally misguided” on moral grounds. (iii) Finally, some may argue that recognising irregular migrants’ labour rights would undermine the whole system of rules regulating migration flows, which is based on the power of the state to decide entry, stay and work in its territory. At this point, we may consider this argument outweighed by the considerations of principle and policy discussed above. However, it is worth evaluating it in the light of other rules’ relative strength and the need for coherence and integrity within the legal system. The potential clash between the rules regulating migration flows and the rules intended to respect, protect and promote human rights is particularly evident in cases involving severe forms of labour exploitation of irregular migrants, such as domestic servitude, labour exploitation and trafficking. Migrant Rights Centre Ireland have considered that the treatment suffered by Mr Younis amounts to trafficking for forced labour and pointed out that abusive employers often refuse to renew the employer’s documents so that they can use their undocumented status to isolate and threaten them. Indeed, deception regarding the acquisition of regular migration status and threats of denunciation to the immigration authorities are listed among the ILO indicators of forced labour. The Rights Angle has already reported the case of M., a Nigerian girl who suffered severe labour exploitation while working as a domestic worker in the United Kingdom, likely amounting to trafficking for forced labour or domestic servitude. The labour courts that heard M.’s case not only ignored the gravity of the crimes possibly suffered by her, but also denied M. any compensation or backpay for the one and a half years during which her work was not paid, relying on the “illegality doctrine”. Applying the “illegality doctrine” to irregular migrants who suffered forced labour and trafficking leads to the paradoxical conclusion of denying them redress for the exact reason of having been victimised in the first place. This is clearly an untenable position, especially considering the fact that, in many cases, pursuing breaches of employment law is the only avenue for redress available to victims of forced labour and trafficking. In Ireland, the Criminal Law (Human Trafficking) Act 2008 criminalised, inter alia, human trafficking for labour exploitation, including forced labour, but did not define forced labour, making it impossible to prosecute perpetrators. “If Mr. Younis’ account is correct… then he has been the victim of the most appalling exploitation in respect of which he has no effective recourse. […] While I am bound to apply the policy as articulated by the Oireachtas via the 2003 Act, there must be some concern that this legislation will produce (and, perhaps, has produced) consequences which were not foreseen or envisaged. 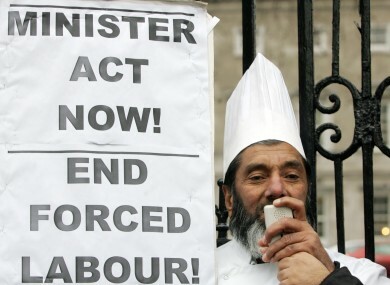 Specifically, it may not have been intended by the Oireachtas that undocumented migrant workers – not least a vulnerable migrant such as Mr. Younis – should be effectively deprived of the benefit of all employment legislation by virtue of his illegal status, even though he or she may not be responsible for or even realise the nature of the illegality” (Amjad Hussein v. The Labour Court and Mohammad Yunis (Notice Party)  IEHC 364 para23). Mr Justice Hogan then took the unusual move to transmit a copy of his judgment to the relevant legislative and executive authorities, for them to “give consideration” to the purported policy implications of the Employment Permits Act 2003. The Irish government announced plans to amend the Employment Permits Act 2003 “to ensure an employer cannot benefit from the fact that a contract of employment is illegal and, therefore, not legally binding.” The Bill, which has not been tabled yet, would “provide a defence to the employees and to give the courts some discretion when faced with similar circumstances”. It is unclear whether any legislative change, which is likely to be narrow in scope, would apply retroactively. In the meantime, about 24,000 irregular migrants in Ireland have no recourse to Irish courts to vindicate their labour rights. Migrant Rights Centre Ireland reported that some employers are using the High Court decision to avoid paying the money they owe to migrant workers and that cases waiting to be heard in the employment courts have been adjourned indefinitely pending clarification on the matter. Mr Younis appealed the High Court judgment. His case is currently pending before the Irish Supreme Court. In July 2013 he received, together with Migrant Rights Centre Ireland, a social justice award. Francesca Pizzutelli, “Do employers have to pay irregular migrants’ salaries? The Younis case in Ireland and the ‘illegality doctrine’”, The Rights Angle, https://therightsangle.wordpress.com/, 14 August 2013. The Appellant in this case requested that there be no reporting of any details that could identify her or her former employers, even though they have already been used in the public domain in the past. In this article, she is identified as M. and the respondent is identified as Mrs A. The story, as reported by the Employment Tribunal which later heard the case, is unfortunately common. M., a Nigerian girl in her early teens, had been working as a domestic worker for two years when she was offered the opportunity to travel to the United Kingdom to look after the A. family’s children. She was promised that she would be paid £50 a month and attend school in the UK. She accepted the offer, especially as she wanted the opportunity to go to school. To get a visa and a passport, she told the authorities that she was planning to visit her grandmother, lying about her name and age. M. lived with the A. family about one and a half year, during which she looked after three young children aged 5, 4 and 3, feeding, cleaning and dressing them, as well as cleaning the house and washing the dishes. Contrary to what she had been promised, she was not paid for her work and did not go to school. She suffered serious physical abuse and it is unclear whether she ever left the house alone. In the words of the Employment Tribunal, M.’s irregular migration status in the UK gave the A. family “power and control over [her] by threatening that if she was noticed by the authorities then she would likely be imprisoned”. When M. was found in a supermarket car park, after having finally been thrown out of the house, she was afraid of the police and very worried about what might happen to her because of her migration status. M.’s case seems to fall squarely within the UK definition of trafficking. According to the Employment Tribunal, M.’s arrival in the UK was arranged by the A. family. Once in the UK, she was reportedly subjected to both threats and deception to induce her to work. Her young age and lack of resources, friends and family in the UK increased her vulnerability and dependence in her relationship with the A. family. In fact, there are remarkable similarities between M.’s case and the 2005 case of Siliadin v. France, in which the European Court of Human Rights found that a Togolese girl was held in servitude in violation of Article 4 of the European Convention on Human Rights (ECHR). The presence of indicators of trafficking for labour exploitation and domestic servitude should have pushed the UK authorities to start a criminal investigation into M.’s case, as required under international human rights law (see: ECtHR, C.N. v The United Kingdom, judgment, para69). Instead, there is no mention of criminal investigations into M.’s complaints in the Employment Tribunal’s decision. In view of the gravity of the crimes possibly suffered by M., the silence of the Employment Tribunal on the trafficking and labour exploitation aspects of her case is deafening. The Tribunal found that M. performed “a function similar to that of an au pair”, ignoring that she was underage, unpaid, in an irregular migration status and not allowed to pursue education. Of course, it can be argued that it is not for an Employment Tribunal to consider the criminal aspects of a case before it. Let’s consider, then, what should have been the Tribunal’s main concern: compensation. No compensation for irregular migrants? Article 13 of the European Convention on Human Rights guarantees the right to an effective remedy to all those whose rights under the Convention are violated. A specific right to compensation and legal redress for victims of trafficking is guaranteed, among others, under Article 15.3 and 15.4 of the Council of Europe Convention on Action against Trafficking in Human Beings, which the UK ratified in December 2008. Despite these obligations, the Employment Tribunal held that, as M. knew that she was not legally allowed to work in the UK, her contract of employment was illegal, with the result that she could not bring claims for unfair dismissal, breach of contract, unpaid wages and unpaid holiday pay. The Tribunal applied what is known as “illegality doctrine” or “illegality defence”, whereby courts can refuse to enforce obligations arising from an illegal deal. Acknowledging that M.’s case was “probably one of the saddest case that has come before this Tribunal”, however, the Employment Tribunal decided that her dismissal was an act of unlawful direct racial discrimination and awarded her £6,000 for injury to feelings. These findings were initially confirmed in appeal. The Court of Appeal (Civil Division), on the other hand, applied again the “illegality defence” to reject M.’s claim and refuse any compensation. The Court of Appeal’s decision is currently under review before the UK Supreme Court. Unless it is quashed, irregular migrant workers who are victims of labour exploitation, trafficking for labour exploitation, servitude and slavery would be unable to obtain compensation from UK employment courts on either contractual or discrimination grounds. In a 2009 consultation paper on The Illegality Defence, the UK Law Commission recommended that the courts should apply the “illegality defence” only after a consideration of when this is justified on the basis of the policies that underlie it, including “furthering the purpose of the rule which the illegal conduct has infringed” (para 8.3). In the case of individuals in an irregular migration situation, the purpose of the rule infringed would be the regulation of migration flows. While this is a legitimate purpose, states’ discretion in the adoption and enforcement of migration policies is limited by their obligations under international human rights law. “any national rules on illegality must comply with the European Convention for the Protection of Human Rights and Fundamental Freedoms (ECHR) as incorporated into UK domestic legislation by the Human Rights Act 1988” (para 3.90). “if, and to the extent that [the application of the illegality defence in a contractual context] might [infringe any rights protected by the ECHR], it is quite clear that the defence would have to be applied flexibly in order to satisfy the requirement of legitimacy and proportionality” (para 3.95). In M.’s case, as well as in all other cases of labour exploitation and trafficking of irregular migrant workers, national rules on illegality should not apply when their application would result in a violation of the right to remedy under Article 13 of the ECHR. The irregular status of migrant workers who become victims of trafficking and exploitation cannot stop them from obtaining justice from UK courts. Francesca Pizzutelli, “M., or how the UK can fail victims of trafficking and forced labour”, The Rights Angle, https://therightsangle.wordpress.com/, 5 April 2013.